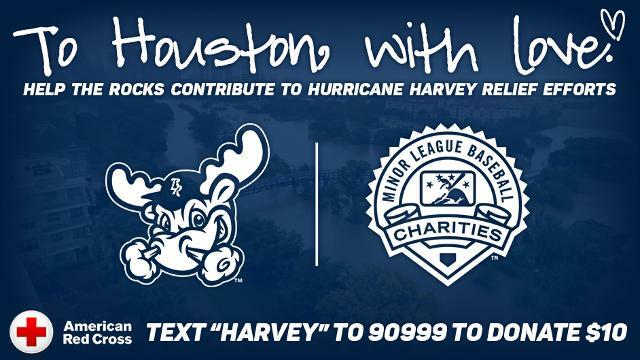 Wilmington, DE - With the recent devastation caused by Hurricane Harvey in Houston and the region of southeast Texas, the Wilmington Blue Rocks are partnering with their fans to help raise funds and provide relief for the communities impacted by the historic storm. The Blue Rocks will donate $2 for every box seat and reserve box seat purchased online using the promo code RELIEF, for games from Saturday, September 2 through Monday, September 4. Additionally, the Blue Rocks will donate all proceeds from the team's Hurl the Pearl promotion, along with the proceeds raised from their Launch-a-Ball contest on Saturday, September 2. The club is also having an online auction of original artwork featuring mascots Rocky Bluewinkle and Mr. Celery, with all proceeds going directly to the Hurricane Harvey relief fund. "Our hearts and prayers are with the people of the Texas Gulf Coast during this very challenging time," said Blue Rocks owner Dave Heller. "Whether it be money or needed clothes, we are asking all of our fans to join us in helping our fellow citizens along the Gulf. And with Minor League Baseball matching fans' donations, we are really hopeful that our fans, along with the great baseball fans across the country, can make a real difference to Americans in need." "The damage that Hurricane Harvey has caused to the regions impacted is catastrophic," said Blue Rocks General Manager Andrew Layman. "The Blue Rocks are happy to contribute to the relief fund for Hurricane Harvey. I know our great fans will also be pleased to know that the proceeds from the multiple ways we plan to raise funds and the donation boxes that will be stationed at the ballpark will be aiding the victims affected by the storm."